Why would a pest control company offer services to improve your home’s efficiency? The answer is very simple. Some home related options can actually make your house or business less attractive to insects and nuisance wildlife. Other benefits of our home improvement options are lower energy costs, increased comfort, and reduced maintenance work. 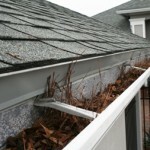 Clogged gutters, aside from not allowing rainwater to properly flow, create an environment that attracts ants, roaches, and other insects. When these insects are living in your gutters, they will soon find their way through cracks in your fascia or soffit. Our gutter protection work includes the added benefit of closing off gutters to deny easy access by rats, mice, squirrels, and other wildlife. Other commonly advertised “gutter caps” are not designed to provide wildlife exclusion benefits. The patented LeafProof® gutter protection, which features a lifetime warranty, serves as a shield to keep leaves, pine straw, and other items out of your gutter system. In addition to protecting your gutters from becoming a haven for insects, our LeafProof® system also means that you no longer have to worry about cleaning your gutters! While our gutter protection system will reduce your insect problems, we recommend a multi-faceted approach to pest protection including our Atlanta pest control. The typical Atlanta area house falls far short of the insulation standards recommended by the US Department of Energy. Houses older than 10 years probably have lower insulation values than when the house was new, thanks to insulation that has settled or fallen loose. Modest investments toward improving your home’s energy efficiency will have an immediate impact on your monthly utility bills. If you are interested in lowering your utility bills, click the link to learn more about our home insulation services. Every home contains dissolved moisture. This moisture has a direct effect on your indoor comfort, and can potentially cause damage to your home’s foundation or structural framing. A house needs adequate ventilation to control moisture. Most homes have vents in the soffit area which allow the attic area to breathe. Unfortunately, the majority of houses do not have proper crawl space ventilation. Crawl space ventilation, along with an appropriate moisture barrier, will help to protect and preserve the wood in you subfloor. The ability to lower the chances of freezing pipes under your house is another excellent reason to invest in crawl space ventilation. Click the link to learn more about our home moisture control.